Luxe High Performance Eyeshadow Trio With Age Reverse and Prevent Complex. Naturally Pretty Eyeshadow Trio is rated 4.5 out of 5 by 85. An Anti-Aging powerhouse! 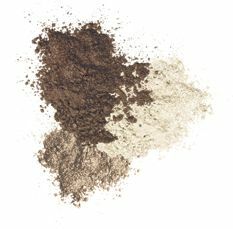 The Luxe High Performance Anti-Aging Eyeshadow Trios are all about great intense pigment, in a naturally pretty look. They are packed with skin-loving ingredients such as Hydrolyzed Collagen, Acai, Green Tea and Vitamins A, C, & E and free of all of the bad ingredients that make eyes appear older like Talc. Developed with leading plastic surgeons, this eyeshadow trio helps treat skin and provides a more youthful radiance while providing instant coverage for imperfections and beautiful naturally pretty colors. The ultra luxe shadows glide pigment onto your lids easily for an airbrushed application that lasts all day. Using the dual Heavenly Luxe® No Tug® Eyeshadow Brush, apply Naturally Pretty Eyeshadow Trios for a beautiful, naturally pretty look that never creases and lasts all day! Use the large fluffy brush for all over lid and crease application. Use the smudger, No Tug® side for naturally lining below the lower lash line. For a more dramatic look, simply wet the Naturally Pretty Eyeshadow Trios and use as cream shadows or eyeliners! Then apply two coats of Hello Lashes Mascara to add beautiful length and volume to your lashes. Rated 4 out of 5 by Lois620 from Really pretty colors The reason for the 4 star review and not 5 is because I wish they were more of a matte finish. Goes on nicely and stays all day. Rated 5 out of 5 by Jennykimen from Great shadows I bought this a few months ago and have gotten lots of compliments. I just purchased a trio as a gift for my sister. Rated 5 out of 5 by Daau1 from Love It! I absolutely love the color palette and the way the eyeshadow goes on and it lasts all day! Rated 5 out of 5 by Ashly from Perfect Spring colors! I have used this trio for a couple weeks now. Absolutely love it. Perfect combo. Light enough for everyday use but just the right amount of color to bring out the spring look. What are the best trio's for green colored eyes? Hi there! Thank you for your question. All shades of Naturally Pretty Eyeshadow are flattering on all eye shades, and skin tones! Which you choose is a matter of personal preference. We hope this helps. XOXO Tina. How would I use the eye shadow &quot;wet&quot;? Which Naturally Pretty eyeshadow for brown eyes, dark brown hair, &nbsp;use light in CC foundation? Which color trio has a shade close to champagne? Is the eye shadow 'soft light' included in any of the trio palettes? &nbsp;Will you be offering refills on individual colors? Which colors are in the Naturally Pretty nudes?